In the rain forest, the Turtles have tracked down a band of ocelot poachers. They try to sneak up on them, but the poachers hear them and open fire with their machine guns. The Turtles retreat as the poachers escape with the caged wildcats. The Turtles follow the trail left by the poachers, which leads them to a jaguar-shaped temple in the jungle. Suddenly, they’re attacked by Jagwar, who mistakes them for more poachers. Jagwar slices off Raph’s bandana in his anger, but Leonardo calms him by reminding him that they’re friends. Jagwar apologizes for not recognizing them at first and then invites them back into his temple. Inside, they find the poachers trapped in their own cages with the ocelots freely stalking around them. Michelangelo thinks the reversal of situations is “cool for cats”. 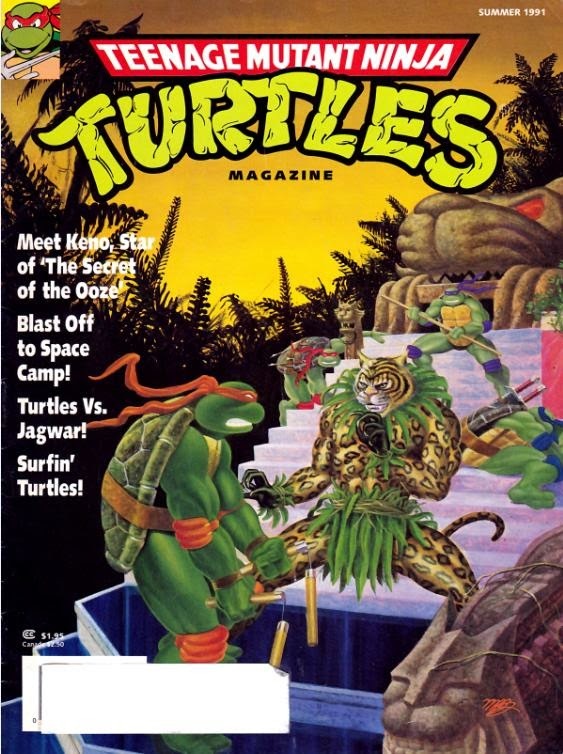 *This story is continued from TMNT Magazine (Welsh) #4. The story continues in TMNT Magazine (Welsh) #6. *The title “Wildcat Blues” is a riff on “Puma Blues”, a comic Steve Murphy (Dean Clarrain) wrote and published through Mirage. *Unlike many of the mutant characters who made their first appearance in this magazine, Jagwar was first introduced in TMNT Adventures #14 (September, 1990). The only story arc in TMNT Magazine continues, with the Turtles fighting more stereotypical crime in South America. Last time it was deforestation, this time it’s poaching. The South American tour arc of TMNT Adventures wasn’t one of its more graceful storylines and this little trilogy is basically that arc in miniature. I guess in this way it’s a bit more digestible, though it’ll still make your stomach hurt. 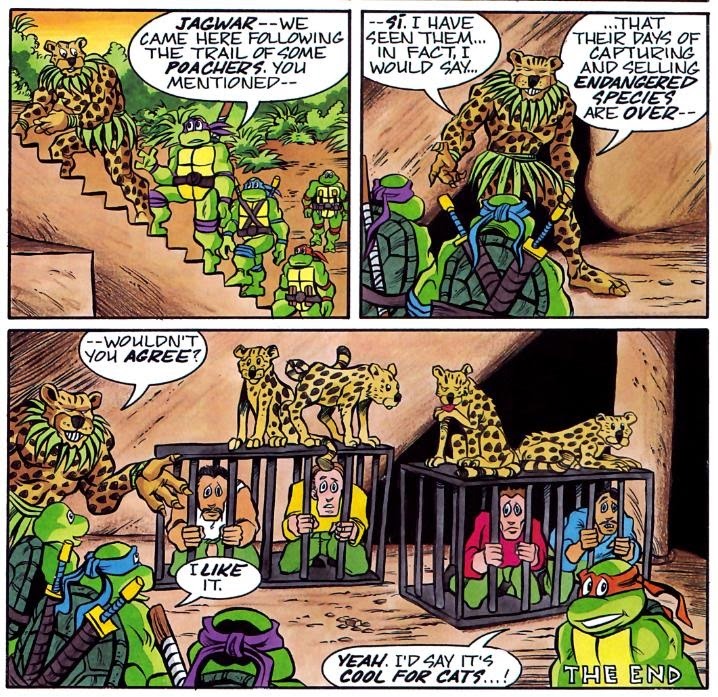 Since Jagwar had already been introduced to the public in TMNT Adventures, the Turtles treat him as an old friend in this story (much like Man Ray in TMNT Magazine #1). It’s the opposite of characters like Warrior Dragon and Nocturno, who were introduced here before getting bigger roles in the Archie book. The continuities are still unconnected, but it’s neat to see the synergy between the two publications; Murphy was pretty much operating under the assumption that his Magazine readers were familiar with Adventures. Now, having Jagwar fight the Turtles when he first meets them and then remember that they’re friends (because they already met in another book that’s unconnected to this one) is a little odd. I mean, he mistakes them for poachers? In broad daylight? 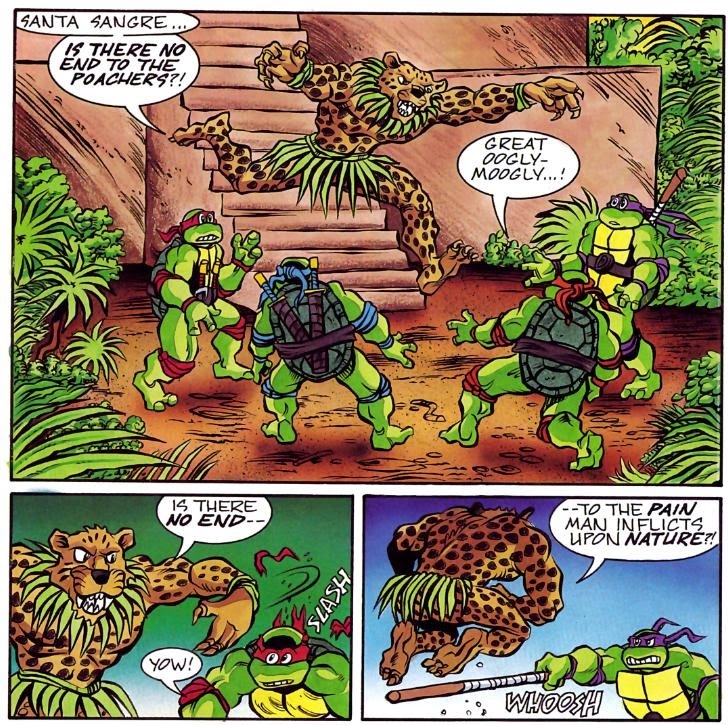 Then again, Jagwar’s first appearance in TMNT Adventures and this issue are only separated by half a year; maybe Murphy rewrote this script to account for Jagwar’s previous introduction and the rewrites didn’t really sync up with… logic. I dunno. It’s more thought than these four pages deserve. Why the Hell does Jagwar have a tiger's head on the cover?